Friends! I’m so excited to bring you this delicious kitchen staple that is SO easy to make. I’ve been telling all of my friends how they should start doing it, too. 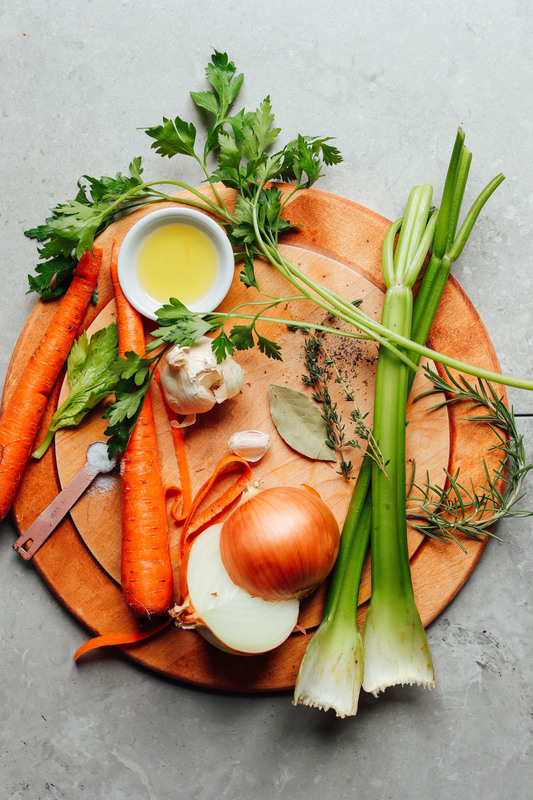 Consider yourself part of the inner circle who gets in on a secret: Making vegetable broth is what all the cool kids are doing. Let me show you how! 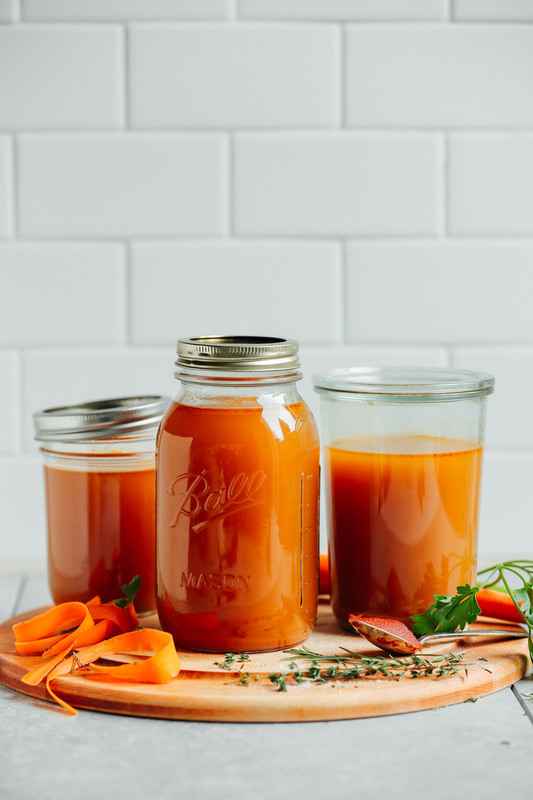 The inspiration for making my own broth originally came from my pal Phoebe, who shared in her wellness book about making broth from vegetable scraps and garlic and onion skins collected throughout the week. BRILLIANT! Why had no one told me this before? Ever since, I’ve been saving a big bag of vegetable scraps (carrot peels and tops, greens on their last leg, onion ends, etc.) in a bag in my freezer, and when it’s full, I know it’s broth time. I start by sautéing the sturdier vegetables down until soft and tender. Then I add water, salt, pepper, and herbs. Herbs add the “umami” to the soup, in my opinion. I went with fresh thyme, parsley, and rosemary and a bay leaf for good measure. And for even more depth of flavor? 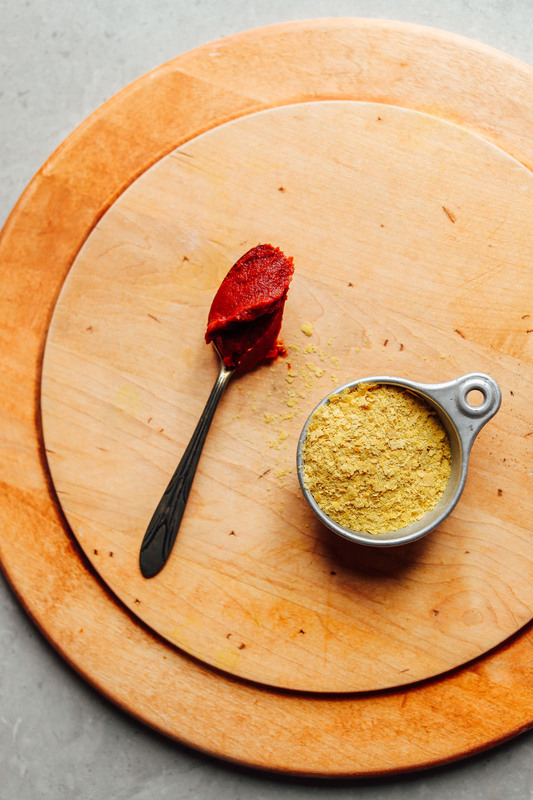 Tomato paste and nutritional yeast! I know it sounds like an unlikely combination that makes this broth cheesy and tomato-heavy. But a little goes a long way in adding extra “oomph” to the broth and helps take it from vegetable water to AMAZING broth! After about 1 hour of simmering on low, the flavors develop and your broth is ready to go. Of course, you can cook it longer (the longer the better, really). But 1 hour is about the minimum for truly delicious broth. All that’s left to do is strain into storage jars and you’re set! This broth makes the PERFECT base for soups, sauces, gravy, and all kinds of recipes, like my 1-Pot Vegan Minestrone, Simple Vegan Stuffing, Easy Vegan Poutine, Thyme & White Bean Pot Pies, Mushroom & Leek Risotto, Tomato & Vegetable White Bean Soup, 1-Pot Curried Lentil Potato Soup, and Coconut Curry Ramen. 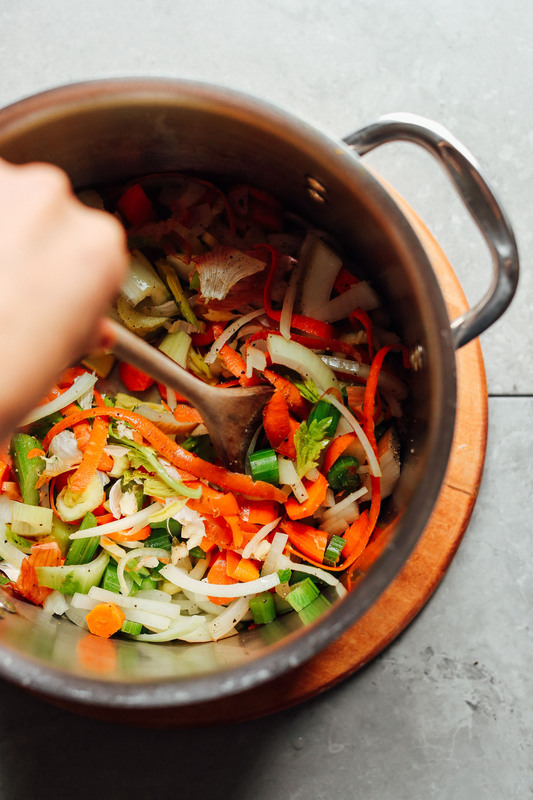 An easy, 1-pot recipe for homemade vegetable broth! 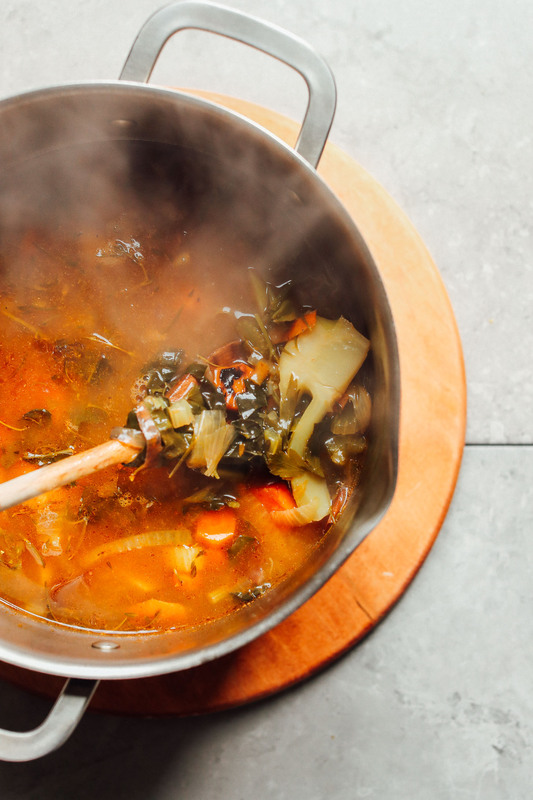 The perfect way to use up vegetable scraps and skins to make delicious broth for soups and more! Heat a large pot over medium heat. Once hot, add oil (or water), onion, garlic, carrots, and celery. Add 1/2 tsp each sea salt and black pepper and stir to coat. Sauté for about 5 minutes or until softened and slightly browned, stirring frequently. Add water, greens, parsley, thyme, rosemary, bay leaves, and another 1/2 tsp sea salt and black pepper and increase heat to medium high until the mixture comes to a boil. Once boiling, reduce heat to a simmer and add nutritional yeast and tomato paste (add less of both for less intense flavor, or more for bigger more robust flavor!). Stir to combine and loosely cover (with the lid cracked). Continue cooking for at least 30 minutes, preferably 45 minutes to 1 hour. The flavor will deepen the longer it cooks. Near the end of cooking, taste and adjust flavor as needed, adding more herbs for herby/earthy flavor, salt for saltiness, pepper for a little spice, or tomato paste or nutritional yeast for “umami” and depth of flavor. In total, I added about 2 tsp sea salt and black pepper and all of the suggested amount of nutritional yeast and tomato paste (both of which add depth of flavor and make the broth rich). Let cool slightly before pouring over a strainer into another pot. Then divide between storage vessels (I prefer glass mason jars). Let cool completely before sealing. Store in the refrigerator up to 5 days or in the freezer up to 1 month (sometimes longer). Perfect for use in soups, recipes, gravy, and more! Recipes listed above. *Nutrition information is a rough estimate for 1 cup of 10 calculated with the oil, all of the recommended salt, pepper, tomato paste, and nutritional yeast and without the vegetables because they are strained. *Recipe inspiration from Jennifer’s Kitchen.